Spectral estimation refers to esimating when only a finite-sized observation record of the time series is available. Different schools of thought have evolved over the years based on varying assumptions and formalisms. Classical methods began first based on Fourier transform techniques and the periodogram, followed by the so called modern spectral estimation methods such as the Burg method, MUSIC, ESPRIT, etc. The mathematics relates to the theory of the Szeg orthogonal polynomials and the structure of Toeplitz covariances. In contrast, recently, the analysis of state covariance matrices, see e.g. [1, 2], suggested a general framework which allows even higher resolution. A series of generalized spectral estimation tools have been developed generalizing Burg, Capon, MUSIC, ESPRIT, etc.. In the following, we will overview some of these high resolution methods and the relevant computer software. Their use is shown via a representative academic examples. where and . These are closer than the theoretical resolution limit of Fourier method. where . The periodogram can be efficiently computed using the fast Fourier transform (FFT). There is a variety of methods, such as Welch and Blackman-Tukey methods, designed to improve the performance using lag window functions either in the time domain or in the correlation domain. In situations when the data length is short, to get a smooth spectrum, we may increase the data length by padding zeros to the sequence. Using the above example, we pad up by adding zeros. 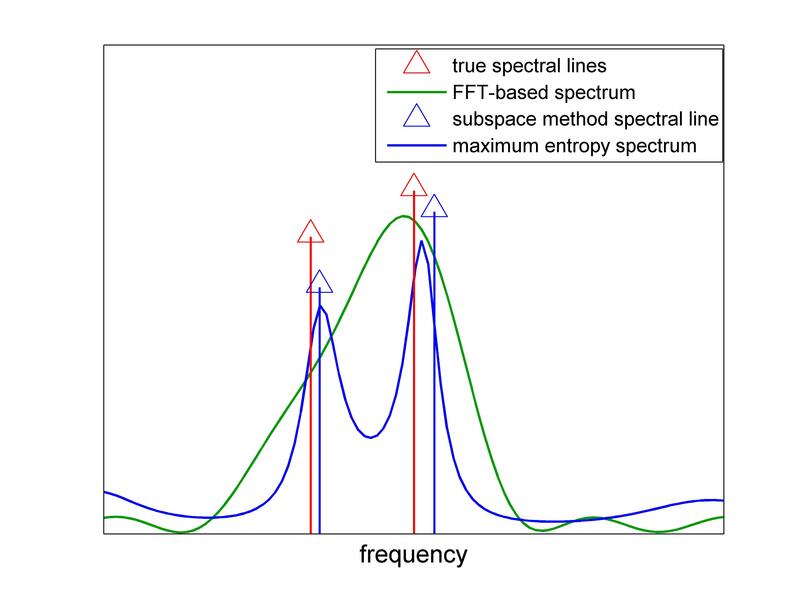 The corresponding FFT-based spectrum is shown in the following figures. Rudimentary code is displayed as a demonstration. A file to reproduce the following results can be downloaded. Alternative matlab build-in routines for periodograms are periodogram, pwelch, etc. The first step to explain the high resolution spectral analysis tools is to consider the input-to-state filter below and the corresponding the state statistics. The process is the input and is the state. the sample state covariance matrix. The corresponding state covariance is Toeplitz matrix. Thus the state-covariance formalism subsumes the theory of Toeplitz matrices. The routine dlsim_complex.m generate the state covariance matrix (dlsim_real.m for real valued problem). The following figure plots versus . The gain at equal and is approximately dB below the peak value. The window is marked in the following figure. The figure to the right shows the detail within the window of interest. and is the input-to-state filter defined above. This formula subsumes the classical Burg method/AR modeling where the is a Toeplitz matrix and is tapped delay line filter. The maximum entropy spectrum is obtained using the routine me.m. 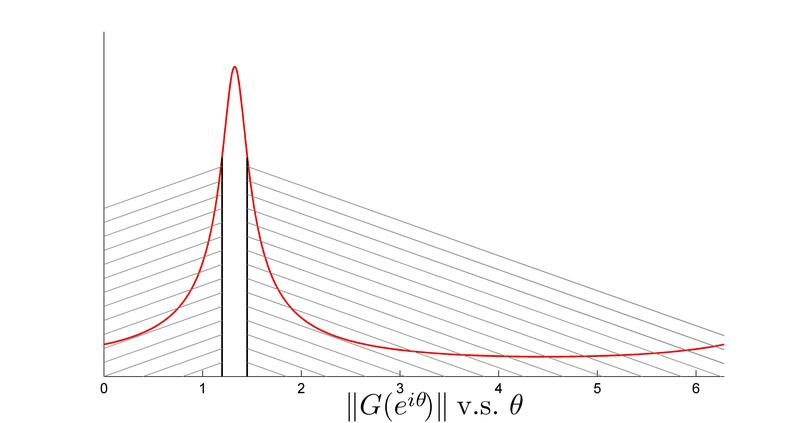 For the example discussed above, the maximum entropy spectrum is shown in blue. There are two peaks detected inside the window. Burg's spectrum is shown in green. The resolution of Burg's solution is not sufficient to distinguish the two peaks. where is the Dirac function. The decomposition corresponds to a set of white noise. See MA decomposition for a decomposition corresponds moving-average (MA) noise. where is generalization of . where and are the first and the last columns of , respectively. Based on this decomposition, there are two ways we can proceed generalizing the MUSIC and ESPRIT methods, respectively [P. Stoica, R.L. Moses, 1997]. Given a sample state covariance matrix and an estimate on the number of signals , we let be the matrix of singular vectors of the smallest singular values, and be the corresponding trigonometric polynomial for . Two possible generalization of the MUSIC method are as follows. Spectral MUSIC: identify , for as the values on where achieves the -highest local maxima. Root MUSIC: identify , for as the angle of the -roots of which have amplitude and are closest to unit circle. where is row vector and a matrix. The eigenvalues of are precisely for . If is a Toeplitz matrix and , given as in with a companion matrix, then we recover the ESPRIT result [P. Stoica, R.L. Moses, 1997]. The signal subspace estimation is computed using sm.m, whereas music.m and esprit.m implement the MUSIC and ESPRIT methods, respectively. For the example discussed above, the estimated spectral lines are shown in the following figure. For an extensive comparison of the high resolution method sm.m with MUSIC and ESPRIT methods, see the example. where  represents the state covariance for the sinusoidal input . This generalizes the Capon spectral estimation method which applies to  being Toeplitz matrix and  the tapped delay line transfer function. The Capon method may be motivated by a noise suppression formulation aimed at antenna array applications [P. Stoica, R.L. Moses, 1997]. Page generated 2012-03-12 13:53:07 Central Daylight Time, by jemdoc.